Vitiligo is a dermatological condition that results in a loss of pigmentation of the skin and hair. The outcome is the formation of smooth white patches of skin on any part of the body. In black patients the white areas will stand out and can cause a severe cosmetic problem, whereas in people with Celtic skin it is vastly less troublesome. There are a few theories about why this loss of pigment occurs. All the theories involved the destruction of the pigment forming cells, i.e. the melanocytes. The most common theory is that an auto immune reaction against melanocytes leads to their destruction. It is unknown what triggers this auto immune response. Another theory proposes that the melanocytes self destruct for an unknown reason and a third theory proposes that the melanocytes are induced to die by abnormally functioning nerve cells. Once a melanocyte is destroyed the area of skin that it would normally keep pigmented, turns white. Vitiligo affects men and women equally and about 1% of the population will be affected at some stage in their life. Vitiligo itself is not a dangerous condition and does not pose any health risk. 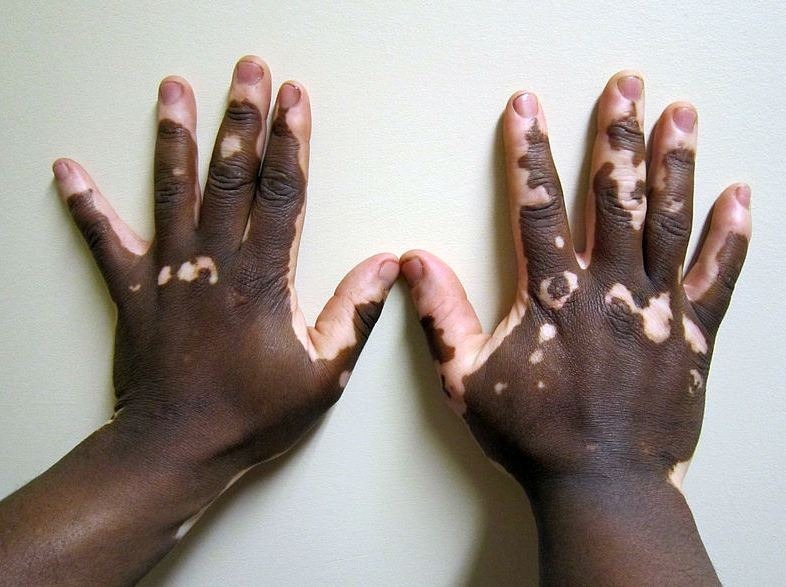 Vitiligo can sometimes be associated with other conditions that might need treatment. These conditions include Diabetes, Thyroid problems, Pernicious anaemia (a reduced red blood cell count due to poor absorption of Vitamin B12), Alopecia Areata (a type of hair loss), Addison’s disease etc. These conditions are also auto immune diseases. I will be posting other articles about Vitiligo including “What does Vitiligo look like” and “The treatment of Vitiligo”.